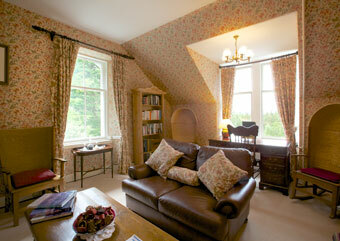 in a highland setting near Ballater and Aboyne on Royal Deeside. 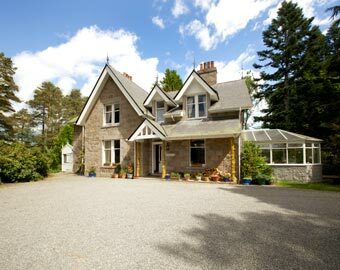 Glendavan House is a traditional Victorian house situated in one of Scotland's National Nature Reserves, The Muir of Dinnet, with views across Loch Davan to the Grampian mountains. 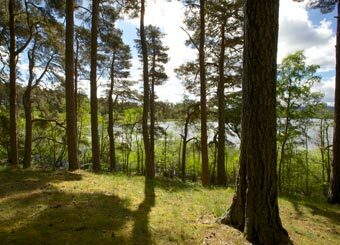 It is set in a heathery clearing among the Scots Pines you can see in the photograph at the top. Alan and Moira Milne and their daughter Rebecca warmly welcome guests for bed and breakfast. 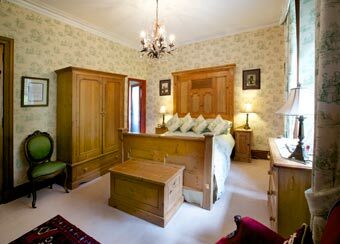 They have three extraordinarily spacious and comfortable bedroom suites - the best rooms in the house - and everything is arranged so well they have been awarded the highest accolade, 5 Gold Stars, by Visit Scotland. Red squirrels regularly come to the Glendavan bird tables and deer can often be glimpsed in the woods around the house. In a short walk you are on the shore of the loch which is completely unspoilt, with greylag geese, wild duck, whooper swans nesting among the reeds, otters - all surrounded by alder, birch and pine woodland. The woodland floor is rich with native plants and you can smell the scent of pine in the air - this is a truly peaceful place for quietness and contemplation. Glendavan is also a perfect base for exploring the valley of the river Dee, the mountains of the Highlands and to go walking in wild places. There is a memorably beautiful drive through the hills to the Speyside whisky distilleries and the Moray coast, and to east the castles of Aberdeenshire. This is a place you'll want to stay for days and days! 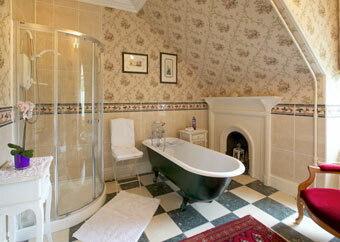 Double bedroom, right, with whirlpool bathroom en suite, left. The bathroom has a bath, walk-in shower basin and wc. 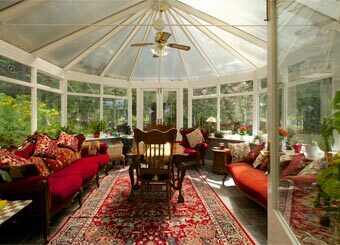 The Ogston Suite has its own Conservatory, and comfortable Sitting Room with log fire, arm chairs and writing desk, below left and right. Bedroom with double 4 poster bed, right. En suite bathroom with roll-top bath, separate shower and wc, below left. 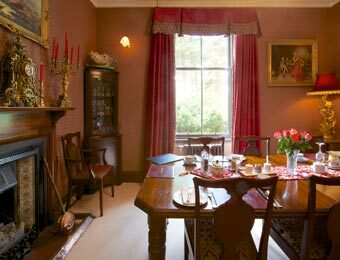 Sitting room with writing desk and views from the front of the house through the pine trees to the heather covered hills. Log fire in winter, below right. The Davan Room is the Master bedroom of the house, right. It does not have its own sitting room like the other two, but it is large with a sitting area and double window with views over Loch Davan. Two single or one double bed, as you wish. En suite Bathroom with power shower. You are welcome to take your time over a generous cooked Scottish breakfast to set you up for the day. Or you can have a tray with coffee, fruit, croissants, bread and pastries in your room. 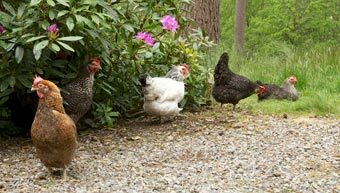 For the evening, there are good places to eat out in Dinnet, the local village, and restaurants and pubs a little further away in Ballater or Aboyne. 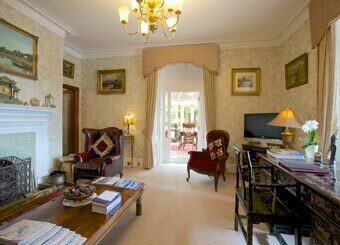 Each suite has digital television and DVD player, CD player, iPod dock, radio and free Wi-fi Internet access. The house is comfortably heated by a biomass log boiler. 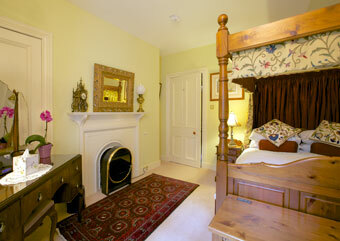 These rates are per room per night and are inclusive of full Scottish Breakfast. Special rates may be available at certain times of the year and for stays of three nights or more. Please do ask at the time of booking. No dogs in the house please, but they may sleep in their owner's car. Please tell Alan, Moira and Rebecca you found Glendavan through About Scotland! (Davan Room photographs courtesy of Alan Milne).